The broad TRRP goal for the 177 acre Deep Gulch and Sheridan Creek site is to increase in-channel habitat diversity for naturally produced salmonids. 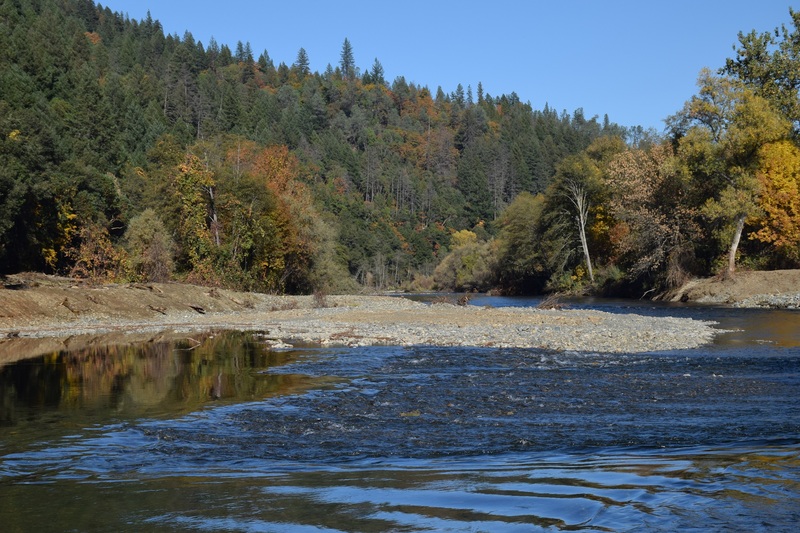 In addition to creating habitat for native anadromous fish, the rehabilitation strategy ensures that habitat complexity and quantity are maintained overtime through interactions with restoration flow releases. Point bar and riffle constructed near Sheridan Creek at the 2017 Trinity River channel rehabilitation project. 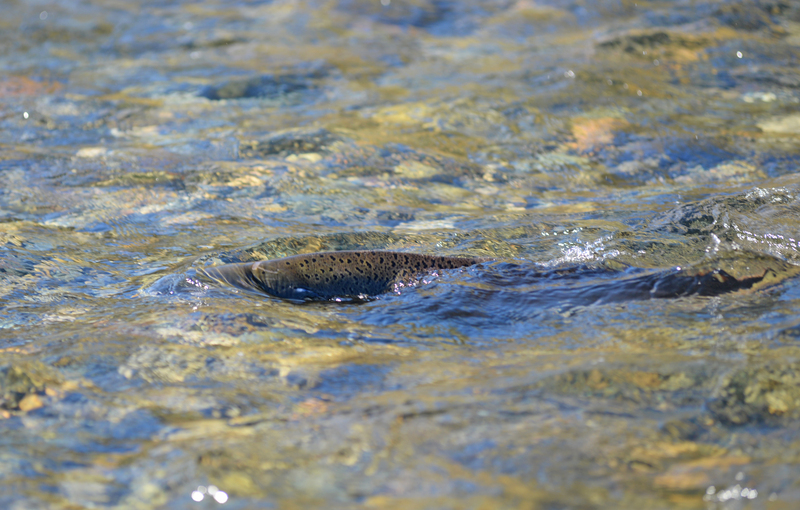 Fall Chinook salmon near a redd (egg nest) in the Deep Gulch and Sheridan Creek project site in late October 2017. 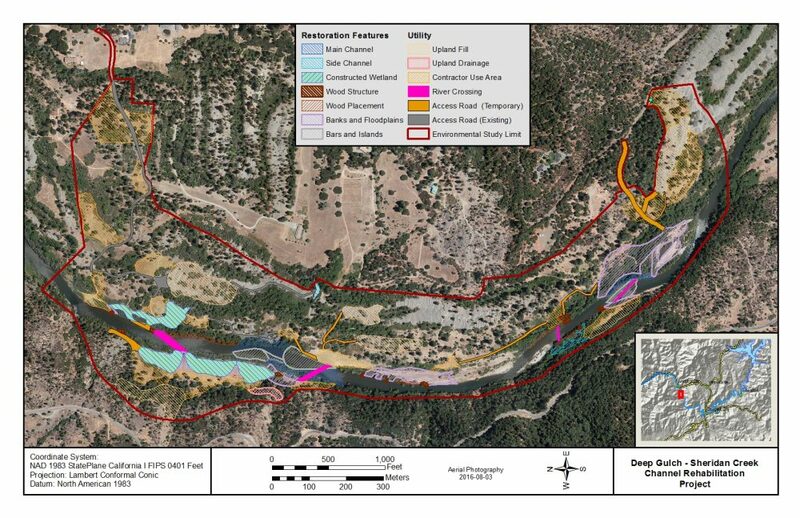 Existing pool and riffle features at the site provided opportunities to increase channel and hyrdaulic complexity by expanding the channel, excavating overbank areas, and installing logjams to interact with river flows that can increase bed topography and create eddies. Existing riffles and multi-story riparian vegetation at the existing Sheridan Creek site provided opportunities to enhance the existing habitat, increase the functional floodplain area, and protect existing high-use spawning riffles. Revegetation efforts at the rehabilitation site began in the fall of 2017 and are currently ongoing. The logic supporting the overall programmatic riparian vegetation goals and objectives is detailed in the Integrated Assessment Plan and a riparian revegetation guide is under development. Success of riparian revegetation is monitored, primarily within the Integrated Habitat Assessment Project (IHAP) – see Riparian Vegetation and Wildlife within the Science area of the website. The 360-degree spherical photos below allow you to explore as you like. If you have a cell phone with adequate directional sensors (or VR device), you can move the photo around by simply tilting or rotating it. Note: Channel rehabilitation sets a stage for the river to develop a better diversity of hydrology and habitats. Constructed features are expected to change over time. See our page on the 2009 Sawmill site for an example. Deep Gulch Channel Rehabilitation Site, constructed 2017. Sheridan Creek Channel Rehabilitation Site, constructed 2017. Forecast changes to Federal Emergency Management Agency (FEMA) Base Flood Elevations (BFEs) based on hydraulic modeling of the project design. No structures were anticipated to be impacted as a result of changes to the river by the Deep Gulch and Sheridan Creek project.